The European Guitar Award is awarded to outstanding creative guitarists. Eligible are soloists and duos from across Europe with the maximum age for potential entrants set at 29. The applicants present themselves solely with their own compositions both in the pre-selection (by way of recordings) and in the final in front of a prestigious jury. After the premiere in 2006, the EGA has become one of the most prestigious awards in the current guitar scene. Welcome to the 3. European Guitar Award! Please send a mail or phone to get more information. The latest competition was held on April 19 2009 (final round) in Dresden. The audience prize was awarded to Christian Buchmann. The CDs of the winners will be commercial in the near future (Johannes Möller / Wildner Records, Kevin Seddiki / Wildner Records, David Lindorfer / Acoustic Music Records, Christian Buchmann tba) and you will be able to experience the musicians live at concerts of the YOUNG MASTERS TOUR. 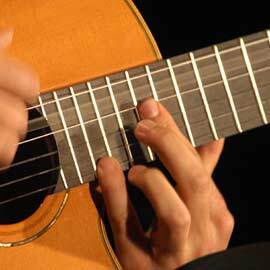 After an unanimous vote of the jury, the European Guitar Award 2006 went to the Hungarian guitarist Antal Pusztai. Along with the award, prize money of 10,000 € is given, concerts in the Young Masters Tour and a CD production at Wildner Records. In addition, he was awarded the audience prize – a guitar from the master workshop of Andreas Dill (Weingarten) valued at 2000 €. Antal Pusztai was born in 1978 in Györ (Hungary), and studied guitar in Vienna with Alvaro Pierri. He was awarded the “Herbert von Karajan Scholarship“, and won several international competitions, both for classical guitar and in the field of jazz (e.g. for the Montreux Jazz Festival). The jury (with Ralph Towner as honorary chairman, Rafael Cortes, Lorenzo Frizzera, Ferenc Snetberger, Michael Langer, Kosho and the artistic director and founder of the competition: Thomas Fellow) was deeply impressed by the presentation from this artist, who – like all the participants – presented himself to the jury and the audience solely with own compositions. The final round was reached by 12 projects from 7 countries. Of this, another project has been awarded an advancement award. The guitar duo Dirks & Wirtz from Germany, already winners of other international competitions, was awarded the European Guitar Award – Sponsor Prize, and 2000 € prize money connected with it and concerts during Young Masters Tour together with Antal Pusztai.